Background: Riboswitches are structured elements that usually reside in the noncoding regions of mRNAs, with which various ligands bind to control a wide variety of downstream gene expressions. To date, more than twenty different classes of riboswitches have been characterized to sense various metabolites, including purines and their derivatives, coenzymes, amino acids, and metal ions, etc. Objective: This study aims to study the genome-wide analysis of the distribution of riboswitches and function analyses of the corresponding downstream genes in prokaryotes. Results: In this study, we have completed a genome context analysis of 27 riboswitches to elucidate their metabolic capacities of riboswitch-mediated gene regulation from the completely-sequenced 3,079 prokaryotic genomes. Furthermore, Cluster of Orthologous Groups of proteins (COG) annotation was applied to predict and classify the possible functions of corresponding downstream genes of these riboswitches. We found that they could all be successfully annotated and grouped into 20 different COG functional categories, in which the two main clusters "coenzyme metabolism [H]" and "amino acid transport and metabolism [E]" were the most significantly enriched. Conclusion: Riboswitches are found to be widespread in bacteria, among which three main classes of TPP-, cobalamin- and SAM-riboswitch were the most widely distributed. 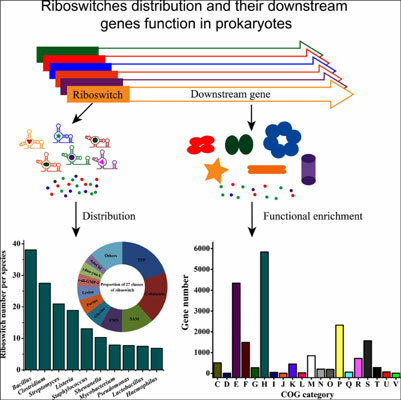 We found a wide variety of functions were associated with the corresponding downstream genes, suggesting that a wide extend of regulatory roles were mediated by these riboswitches in prokaryotes. Riboswitch, prokaryote, bioinformatics, genome, gene regulation, Cluster of Orthologous Groups of proteins (COG).